Valiant’s biggest Free Comic Book Day release ever is about to get even bigger! Valiant is proud to announce that the publisher’s Gold-level offering for Free Comic Book Day 2016 – the VALIANT: 4001 A.D. FCBD SPECIAL – is growing in size to an unprecedented 40 pages! 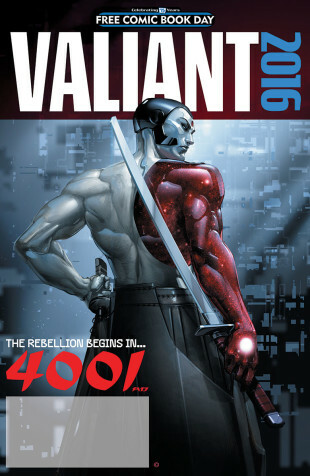 Beginning with an all-new, never-before-seen prelude to Valiant’s blockbuster event, 4001 A.D., the most exciting Free Comic Book Day title of the summer continues with future-facing glimpses of DIVINITY II and A&A: THE ADVENTURES OF ARCHER & ARMSTRONG, plus an all-new slate of top-secret teasers and a newly added excerpt from the series that has everyone talking – the one and only FAITH! First, the most ambitious crossover event of the summer begins here as New York Times best-selling writer Matt Kindt (NINJAK) and all-star artist Clayton Henry (HARBINGER WARS) present an all-new, never-before-seen prelude to 4001 A.D.! Before Rai begins his crusade to unite the 41st century’s most formidable heroes behind the battle for New Japan, his story starts here with a brand-new tale that will only be available on Free Comic Book Day! Then, Valiant’s massive Free Comic Book Day celebration continues with exclusive looks inside Valiant’s biggest releases of 2016, including A&A: THE ADVENTURES OF ARCHER & ARMSTRONG #1 by rising star Rafer Roberts (Plastic Farm, Shutter) and superstar artist David Lafuente (Ultimate Spider-Man); and DIVINITY II #1 (of 4) by New York Times best-selling writer Matt Kindt (Mind MGMT) and blockbuster artist Trevor Hairsine (X-Men: Deadly Genesis)! And now the headline-grabbing hero that has taken comics by storm is joining Valiant’s Free Comic Book Day line-up! Miss FAITH’s record-setting, twice sold-out debut? Then jump on board here with an exclusive look inside the FAITH VOL. 1: HOLLYWOOD & VINE trade paperback collection by red-hot writer Jody Houser (Orphan Black) and explosive artists Francis Portela (Green Lantern) & Marguerite Sauvage (DC Comics Bombshells) before it swoops into comic shops everywhere in June! From The Guardian to MTV to People to the Today Show, find out why FAITH is flying high as one of 2016’s most acclaimed new series here as she joins the star-studded cast of Valiant’s 40-page Free Comic Book Day spectacular – available in participating comic shops on Saturday, May 7th!